Complete grinding plant for powder production industry in cement, painting, cosmetic, plastic, ore processing industry etc. In order to resolve the powder making demands of the clients in chemical industry, cosmetic, paint, plastic, cement, metallurgical industry etc. 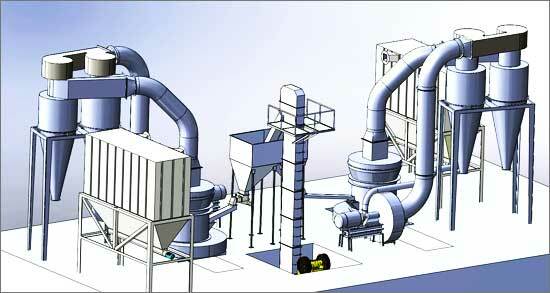 SBM Machinery has design the popular turnkey powder grinding plant for our customers. SBM Machinery designs and manufactures a comprehensive line of grinding equipment as grinding mills, classifiers, and related accessories for both wet and dry grinding systems. We also offer a complete spectrum of engineering services, including testing, process design, installation, commissioning, start-up, and continuous lifetime product support services. The turnkey grinding plant consists of jaw crusher, bucket elevator, vibrating feeder, main grinding unit, blower, cyclone powder collector, centrally electric control system, etc. By equipping with different kinds of grinding mills, the turnkey grinding plant can process many raw minerals. With ball mill, the grinding plant can grind most quarry stone, industrial mineral, heavy sand mineral etc. ; with MTW trapezium mill, the grinding plant can increase grinding efficiency by 15%, and reduce the wear down by 30%; with SCM ultrafine mill, the grinding plant can produce powder down to 3000mesh (or 5um). We are glad to announce that our grinding mill is the most popular grinding machine in turnkey grinding plant in China.